At forty I had just reached the age myself when one begins to differentiate between the stages of later life. There had been a time when I would have regarded it as plainly untragic to be ill and dying in your late sixties, hardly worth struggling against or complaining about. You’re old, you die. Now I was beginning to see that you hung on at every stage—forty, sixty, eighty—until you were beaten, and that sixty-seven can be early in the end game. A dance with death entails a tricky two-step. It is complicated enough to come to terms with your own mortality, but then the joined pirouette: reconciling the disappearance of those you love ... it is not an easy maneuver to master. If you are lucky, you are like a rolling stone with time on your side because perspective evolves. In many areas. Ideologies previously learned are supplanted with what just feels right, intrinsically. But time also raises the stakes, paving new avenues of love (and hate). An abyss of sexuality expands, wielding heavy influence. Spirituality, if no longer the main attraction for all, hangs on for others as a holdover from an evaporating past. Political views materialize as well, impacted by any number of factors such as an increasing awareness—or worse, exposure—to the darker side of life: things like inequality, bigotry, crime, terror, the gravity of war, the ungodliness of genocide, and on and on it goes, breaking news. I am uncertain whether our civilization at this turn of the millennium is cursed by too much or too little belief, whether people like Bernard and June cause the trouble, or people like me. But I would be false to my own experience if I did not declare my belief in the possibility of love transforming and redeeming a life. Love is all you need. If only that were more than just a lovely Lennon refrain. There was just that thing about dying that remained quite the show-stopper. That the whole of a rich and unique life can be so easily erased, memories included, meant that even history itself was not safe from the erosion. As an example, in documenting genocides, a staggering, unfathomable scope of loss is wrapped neatly and precisely into the impossible void of statistics where numbers have no faces and facts, no matter how shocking, are inevitably stripped bare of the full force of their intended horror. The extravagant numerical scale, the easy-to-say numbers—tens and hundreds of thousands, millions—denied the imagination its proper sympathies, its rightful grasp of the suffering, and one was drawn insidiously to the persecutors’ premise, that life was cheap, junk to be inspected in heaps. As we walked on, my emotions died. There was nothing we could do to help. There was no one to feed or free. We were strolling like tourists. Either you came here and despaired, or you put your hands deeper into your pockets and gripped your warm loose change and found that you had taken one step closer to the dreamers of the nightmare. This was our inevitable shame, our share in the misery. We were on the other side, we walked here freely like the commandant once did, or his political master, poking into this or that, knowing the way out, in the full certainty of our next meal. Trying to envision the humanity behind a statistic is an attempt to see the invisible, to touch the untouchable. Nevertheless, we look back in earnest contemplation, feebly attempting to resolve in our minds and hearts the unimaginable, all the while knowing that we are at the same time inseparably linked, present to past, past to future. It seemed as though he had never thought about the war before, not about its cost. He had been so busy with the details of his work, of doing it well, and his widest view had been of war aims, of winning, of statistical deaths, statistical destruction, and of postwar reconstruction. For the first time he sensed the scale of the catastrophe in terms of feeling—all those unique and solitary deaths, all that consequent sorrow, unique and solitary too, which had no place in conferences, headlines, history, and which had quietly retired to houses, kitchens, unshared beds, and anguished memories. 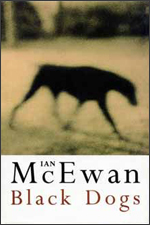 In Black Dogs, Ian McEwan’s command is eye-opening: how he is able to implant, quantitatively, not only a breadth of ideas into the span of such a short novel, but ideas of great depth. It is quite a feat when a novel can make you more aware of your place in the world along history’s timeline and then leverage that awareness into a revelation of what it means in terms of becoming more in tune with your own flashbulb moment. I’ve spent my life discovering that the moment you enter the present fully, you find infinite space, infinite time, call it God if you want. Coming to a better understanding of how we fit into the bigger picture brings with it a certain holiness that is neither easy to describe nor dismiss. That’s how religions are. In the end, though, it hardly matters how you describe it once the essential truth has been grasped—that we have within us an infinite resource, a potential for a higher state of being, a goodness. Closing the pages, I begin to think about about what is left of the day while also thinking about so much more.